Subscribe to my FREE monthly newsletter for tips, information, new products, military family news & events, & words of wisdom. "Thank you, Lisa Nixon Phillips. 'Faith Steps for Military Families' took me deep into God’s Word, revealed its profound relevance for today, and encouraged my heart. 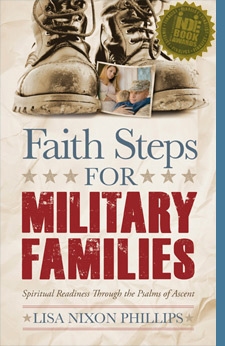 Military families, if you’re looking for solid, biblically-based guidance and hope, look no further. The truth held within the psalms Lisa has chosen to explore has the power to change lives." ~ Jocelyn Green, author of "Faith Deployed: Daily Encouragement for Military Wives," and "Stories of Faith and Courage from the Home Front"
"Bravo for Lisa Nixon Phillips. She has given us a helpful guide to help navigate the difficulties that military families will face during deployment and service. She's able to reach out through the pages of her writing with her endearing and approachable style as she offers practical advice, charming anecdotal stories, and touchstones of wisdom presented as Key Points throughout the chapters. Each chapter is grounded on biblical truth and scripture, each one building upon the other to make a solid foundation and for the reader building a confident relationship with the author. As a civilian, I was able to gain important insight and meaning from this book. I found ideas that will help me better understand and connect with my military friends, family and the community. This is a great read for military and non-military readers alike. Nicely done Lisa. Thank you." Would you like your military family to become more resilient? Does the military lifestyle make you feel as though your family’s lives are on hold? Could your home use more harmony and unity? Combat readiness is a term service members are familiar with. It’s used to train our military for the possible ‘what if’s.’ Spiritual readiness works in a similar way. It prepares the military member and his/her family for the possible what if’s unique to the military lifestyle. Spiritual readiness is about the role faith and religious practices play in response to those what if’s. It’s knowing where your strength, perseverance, peace, energy and motivation comes from. Understanding spiritual readiness is paramount in developing resilience in your family. Studies have shown that people who have a spiritual readiness regime fare better than those who decide to leave the spiritual aspect out. Resilience is one’s ability to rebound after enduring a difficult circumstance, such as a hardship or a major setback, even going on to fulfill one’s aspirations in life. Can you relate to any of these military family scenarios? are you a new military spouse and you’ve just relocated to a new duty station, but you’re finding the transition difficult. do you feel uncertain about the future leaving you with concerns of mental health or behavioral issues. you had a death in the family while your spouse is on deployment? are you dealing with a spouse with Post-traumatic Stress Disorder? are your children not coping well with the deployment and there are problems at school? are you the concerned spouse with the difficult challenge of helping your husband or wife mend from a combat injury? Or is he/she trying to reintegrate back into the home but it has been harder than expected? your spouse is home and you should be thrilled, but your home atmosphere is tension-filled? maybe you’re a wife that gave birth to a new baby while your husband was deployed. Coming back to a new baby in the home is a joyful experience but often that joy gets strained as issues with transitioning surface. In my book, Faith Steps for Military Families, you and I will trek through the fifteen Psalms of Ascent and discover the bounty these intriguing metaphors hold. Each Psalm of Ascent reveals a treasure trove of spiritual insights for rising above and moving forward from various perplexing circumstances, struggles, and emotions typical of military families. what the situation is, God goes with us–He is in the midst of all the messes and pickles we might find ourselves in as a military member, couple, or family. Have you found yourself the victim of someone’s contempt? Let the wisdom and encouragement of Psalm 123 guide you. What about those times when you felt that God had stepped in and safeguarded you? Or have you ever contemplated the number of times He may have prevented harm from touching your husband while deployed or on a training exercise, or safeguarded your family and you were unaware of it? Psalm 124 deepens our spiritual insight to how His love protects. Would you like your family to grow in its trust to resist being shaken off your foundation? There’s a psalm for that too. Of course all of us in military families can relate to feeling like our lives are on hold. You’ve put off going back to school or going back to work because you’ll soon be relocating, or you had to turn down that promotion because you just learned your husband’s ship is changing homeports and you have to let that dream job go to someone else. It seems as if we hold our breaths during the months of deployments only to exhale and begin to live again as soon as our spouses touch American soil–if only until the next deployment. The early Israelites often felt this way, too. See how the psalmist in Psalm 126 describes this period in our lives and what God did for them and can do for you and your family today. Like today’s military families, the lives of the ancient Israelites were complex and often affected by outside forces beyond their control. In Faith Steps for Military Families, you’ll discover these similarities weaved throughout, but they serve to grow us in our understanding of their culture, traditions, triumphs, and even their defeats. And yet, God never puts a period where a comma should be in our lives. He wants us to pause at times for these spiritual understandings grow us into spiritually ready military members and families. What we discover through the Psalms of Ascent is that our estimation of Him is far inadequate of what He is truly capable of doing in our military lives. So how do we build spiritual readiness into our military home? Where do we start? Spiritual readiness starts by examining what your spiritual beliefs are, your core values, and how your family relationships have shaped your understanding of what the meaning of life is and how you perceive God to be. These facets combined ultimately determine how well you respond or cope with the everyday annoyances to deep adversity. Spiritual readiness is looking at life through the spiritual lens of faith. Spiritual readiness acknowledges that we were not meant to figure life’s problems out on our own–that God is the Source of our help, a higher power that has our back, building into our lives a sense of balance and comfort. Without this vital component, spiritual resilience becomes a weak muscle; it’s inadequate to sustain when adversity comes to your door. Unity is the glue that holds together the military family. When there is a sense of harmony and unity in the home, it strengthens family resiliency. Just as the military works as a team or unit, the various military support organizations, your church family, and supportive family members all work in tandem to build stability and unity into your family. We must combat any tendency of spiritual complacency. A complacent faith is a threat to resiliency in our homes. By incorporating my H.E.A.R.T formula, spiritual readiness or well-being can become the tough underlying fabric supporting your military family. Like the early Israelites, military families are today’s pilgrims, always on a journey–always looking ahead to the next duty station. The overarching premise of faith is that it makes a significant difference in the overall well-being of military members and the families. Faith Steps for Military Families is an invitation to journey through the Psalms of Ascent and discover biblical principles to build resiliency and spiritual readiness into your military marriage, family, and personal journey of faith.